But when we’re at the end of our lives and we think back about what mattered most, inevitably what mattered was our relationships. And our most intimate relationships are the greatest indicator of how we’ll feel about life at the end of our days. Our closest relationships are either the things that brought us the most joy, meaning, and connection or the most heartache and pain throughout our lives. But no one teaches us how to be in relationship with one another, how to make it last, or how to make it feel good along the way. No one teaches us when it’s time to throw in the towel because it can’t be saved or how to re-connect after years or even decades of total disconnection. No one teaches us how to express what we need without alienating the one we love or seeming selfish. There was no class in school you missed. There was no secret club extoling all the wisdom on how to have amazing, connected relationships that you weren’t a part of. Unfortunately no one equips us with these tools. So, we’re left with using trial and error…diving into relationships or marriage with the best of intentions, only to find ourselves struggling and feeling trapped or alone or lost. Within the realm of trial and error, as long as we’re trying, there will always be some errors. We will inevitably make mistakes – and so will they. We will think we know what to do – and then somehow it won’t work. We will believe that others will automatically treat us the way we treat them – but it never happens. But just because there aren’t any classes doesn’t mean there aren’t any tools and skills to learn. And just because we’ve logged our fair share of errors doesn’t mean we should stop trying. 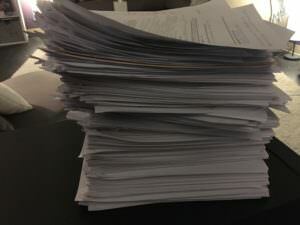 This is an image of the pile of notes I’m having shredded from my office this week. Each page represents a woman I spoke with throughout the past year – hundreds of women who shared with me their biggest relationship challenges and their deepest and most hurtful wounds. And each one of them decided to not take a step forward…. …to just keep doing it their way, hoping something would magically change. For me to shred these is almost a sacred experience, because I know the pain is very, very real for these individuals. And I also know that most of these women are still struggling, still lost in their pain today. No one taught them that there are tools they can use and skills they could learn. And they’re still stuck for only one of two reasons: Either they didn’t believe I could guide them out of their pain or they didn’t believe in themselves enough to take the necessary steps to find their way through the pain. And both options sadden me. But what’s not represented in this image are the 48 people – both men and women – that stepped forward and made the choice to change their lives and their most important relationships; the 48 people that said “yes” to themselves and knew that they were worthy of investing an investment. And these 48 brave souls were willing to tell the truth, own their experience, heal their wounds, forgive the hurts, and learn new tools that improved all of their relationships. Yes, they worked with me to do it…but THEY did the work. And they were the ones that had to take that first step for themselves. My only job was to meet them there, to show up in love, to take them by the hand and not let go. And that will always be my commitment to my clients. Is this the year you change your life and your most important relationships? Which stack will you be in at this time next year? If you’re ready – and you believe I can lead you out of your pain – I’m here and I won’t let you go.